Oh, you've done it again, SF Gate. Your story today on the "Online News War" employs another one of your well-trained, creative graphic artists. Who else would think of using USB cords as fingers? The circuit board skin? The starburst effect behind the half-human/half-machine man? And, my favorite, the never tiresome infinite mirror effect! 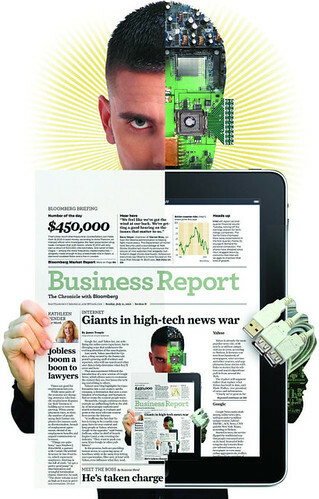 Look, the image keeps repeating itself in the hybrid iPad-newspaper! History is a nightmare from which I'm trying to awaken. Then again, so is the SF Gate. Well played, editors. I thought you couldn't do worse than that last image I complained about. And, well, maybe this isn't worse. But, it certainly isn't better. Dear AIGA, please organize an intervention.